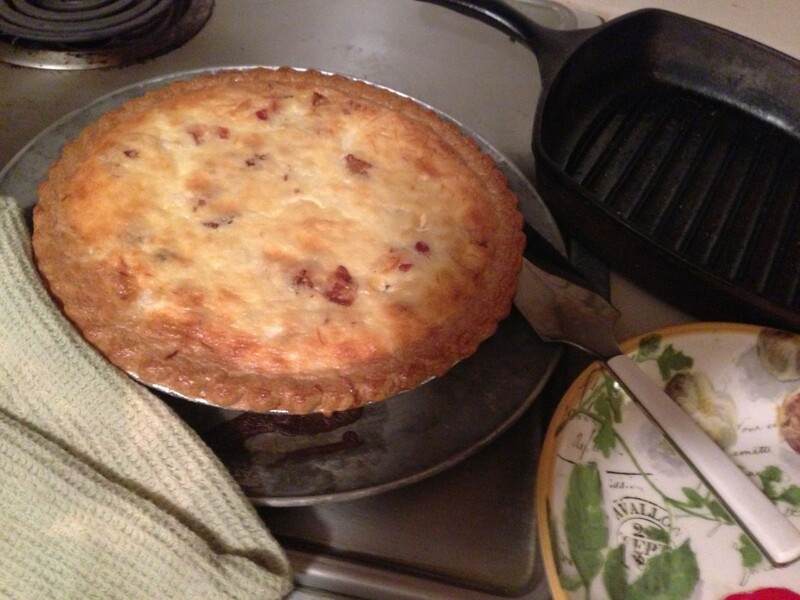 DIY: Another Crowd Pleaser for Your Wedding Dinner: Quiche Lorraine! Finally something for my DIY brides again: a versatile, super-easy crowd-pleasing dish that 1.) can be prepared and frozen; 2.) can be served warm or cold AND 3.) is equally good as an appetizer and a first entree course! So, what’s this miracle dish? Quiche Lorraine, a staple of French cuisine, but an exception in that it is NOT at all difficult. Accompany with mixed greens or heirloom tomato salad – perfect! 12 slices bacon, 1 cup shredded Swiss cheese, 1/3 cup minced onion, 4 eggs, 2 cups heavy cream, salt (ca. 3/4 teaspoon) and cayenne (ca. 1/8 teaspoon) to taste; pinch of sugar. Render bacon and chop. Cook onion in a little bit of the bacon fat until softened; sprinkle in bottom of pie crust together with bacon and cheese. Beat eggs, mix with cream and seasonings. Brush rim of crust with egg mixture, then pour mixture in crust (will be very full!). Set on rimmed baking sheet and bake in preheated oven for 15 min; reduce temperature to 300 degrees and bake until center is just firm, at least 30 min and up to 50 min (every oven is different, so check frequently – if rim becomes too dark, cover with strips of aluminum foil). Let sit at least 10 min before serving (or let cool, or freeze…), cut into wedges, and enjoy! Yield: 6 dinner servings or 8 to 10 appetizer servings.